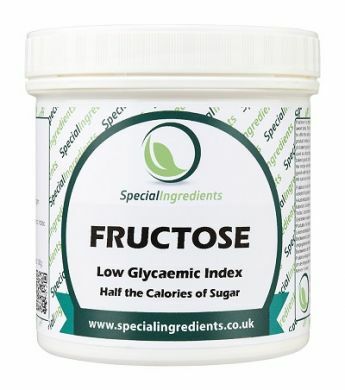 Fructose large tub 1kg is a simple sugar that occurs naturally in foods such as fruits and vegetables. It gives fruits their sweet taste. The fine crystalline fructose is roughly 1.2 times the sweetness of table sugar and can be used to offer the same sweetness but has only 50% of the calories. It offers unique benefits including improved product texture, ice cream texture, taste and stability, mouth feel of beverages and foods and cake height (in baked goods). Fructose is used widely in low calorie products, flavoured water and milk, yoghurt, baked goods, confectionery, fruit juice and many more. It has a low Glycemic Index and is widely used as a food ingredient in the food industry. 1.2 times sweeter than sugar. >Half the calories of sugar. Improves texture, taste and stability. Improves mouth feel of beverages and foods. Improves shelf life of products such as soft cookies and nutrition bars. Can be used as a dietary product. Improves browning on some baked goods. Please store in dry, cool conditions and not in direct sunlight. Shelf life of 2 years. When substituting fructose for sugar in baked goods that rise and non-rise, measure two-thirds cup of fructose for every cup of sugar called for in the recipe and make the recipe as usual, (for non-rise set the oven 10-15° lower than instructed). Baked goods will stay moist longer with fructose than they normally do with sucrose. For all other products add the sucrose to taste which is normally between two-thirds to three quarters fructose in place of sugar.